The following is an overview of most of the Eastern Cape museums in South Africa by location, including descriptions, contact details and website addresses, where available. The Eastern Cape is the second largest of the nine provinces. The natural diversity of this province is remarkable, ranging from the dry desolate Great Karoo landscape to lush forests, fertile valleys, sandy beaches and the mountainous southern Drakensberg region. Ons-Erfenis-Museum is a period house museum whose highlights are a ceramics collection (Wedgewood, Dresden and Staffordshire); yellowwood and stinkwood furniture; silverware, glassware and jewelry. F S Malan Museum features collections of bead work, wooden sculptures and costumes. The Kerkplein Museum, a component of the Aliwal North Museums Complex, is housed in the old Dutch Reformed Church and comprises an interior display of a street scene with shops and houses and an outdoor display of farm implements. Visitors to the Barkly East Museum will be introduced to the history of the Barkly East area and to the furniture, household items and sheep and cattle farming implements once prevalent there. The museum also has a collection of uniforms from the Anglo-Boer War and both World Wars. Exhibits in the Bathurst Agricultural Museum comprise engines, tractors, wagons, buggies, agricultural machinery and tools, some dating back to British Settlers. An old parsonage, two typical Karoo houses, the first theological school and lean-tos in which old wagons and farm implements are displayed comprise the Burgersdorp Cultural Historical Museum. The C M Van Coller Museum is in a turn-of-the-century shop and features early 19th century household items from the Cathcart district. Schreiner House, a satellite of Grahamstown's National English Literary Museum, is a typical example of a 19th century Karoo house. It highlights the life and works of the famous South African writer and feminist, Olive Schreiner, who lived here from 1867 to 1870. The Anderson Museum displays turn-of-the century furniture and clothing, rock art, agriculture and family trees. The East London Museum depicts the natural and cultural history and rich heritage of the region. Best known for the prehistoric coelacanth, the Museum also displays reconstructions of the extinct dodo of Mauritius, along with the only known dodo egg in the world, superb Xhosa beadwork and aspects of German settler history. The Calgary Transport Museum, a satellite of the East London Museum, features a collection of carts, wagons and handcarts from the Border region, acquired and restored by the late Robin Wells. Also on show are a gypsy caravan, a tack room and a wheelwright's workshop and forge. Gately House, a historical monument (1878), is a satellite of the East London Museum. It was the home of John Gately (Mayor of East London several times), his wife Mary Ann, and their twelve children. The Fort Beaufort Historical Museum displays aspects of the military and domestic life of Victorian times as well as a collection of 19th century Frontier Wars weapons. Reinet House is an H-shaped house dating back to 1812 and was originally the home of the Revs Andrew and Charles Murray. It houses a fine collection of period furniture. At The Old Residency, also an H-shaped house, built in 1819, visitors can see displays of firearms, musical instruments and the history of Graaff-Reinet. The Old Library Museum in the town's first library (1847), houses the Lex Bremner Fossil Collection of Karoo reptile fossils, and a collection of Khoi and San art reproductions. Urquhart House, which dates back to between 1815 and 1821, exhibits a fine collection of Victorian furniture, a peach-pip kitchen floor, and a Dutch oven. "old" roses bloom in the Victorian garden and the museum also has a genealogical research centre. Many of Grahamstown's numerous museums are satellites or components of the Albany Museum Complex. Fort Selwyn was built in the shape of a seven-pointed star, enabling the maximum number of men and guns to fire from the walls. It houses displays of weapons and portable furniture used by British officers. Exhibits in the History Museum, a component of the Albany Museum Complex; formerly the 1820 Settlers Memorial Museum, focus on the history and lifestyles of the peoples of the Eastern Cape from 1710 to 1910. The Natural Sciences Museum dates back to 1855 and is the second oldest museum in the country. It exhibits the first dinosaur discovery in SA, a working Foucalt pendulum, an Egyptian mummy, birds, mammals, shells, and a water gallery. The Observatory Museum, housed in a 19th century jeweller's shop and family home, depicts the lifestyle of a well-to-do Victorian family. It is home to the only genuine Victorian Camera Obscura in the Southern Hemisphere. Operating in a dark room, it shows Grahamstown as a miniature moving picture house. The Provost Prison was built in 1835 to house military prisoners. Its unique design is based on the 18th century "Panopticon" system for the "ceaseless surveillance" of prisoners from the windows of the central tower. The International Library of African Music houses a collection of traditional southern African recordings and musical instruments. It includes a library, archive, lecture room and an open-air theatre. TheJ L B Smith Institute of Ichthyology is the leading centre for the study of fishes in southern Africa. The story of the coelacanth is told in a display in the foyer where there is also a marine aquarium. 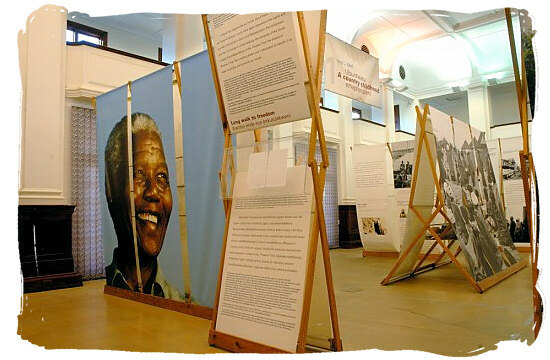 The National English Literary Museum was established to promote the reading and appreciation of all forms of creative South African literature written in English. Temporary displays focus on various writers, literary periods or themes. Highlights of the museum's collection are the Thomas Pringle Papers, the Sir Percy FitzPatrick archive, and the papers of Roy Campbell, Athol Fugard, Johannes Meintjes, and Barney Simon. Visitors to the Eastern Star Gallery, a satellite of the National English Literary Museum, can see printing machinery and other historical items relating to printing, including John Fairbairn's editorial desk. The Humansdorp Museum, a cultural history museum, focuses on the growth and development of Humansdorp through its display of farming implements, bottles, shells, clothing and crockery. It also features a restored water mill. The Amathole Museum (originally the Kaffrarian) was started in 1884 and is the sixth oldest museum in South Africa. It focuses on local history, German settler history, Xhosa ethnography and anthropology and it also has an exhibition of mammals and on a South African animal legend - Huberta the Hippo. The Missionary Museum exhibits the missionary history of the area and beyond, displaying many facets of missionary life and the work of all denominations. The Lady Grey Museum is situated in a Victorian building which housed the "Poor School" between 1898 and 1914. Its exhibits focus on celebrities such as Athol Fugard and Tiro Vorster who have roots in the Middelburg. The Owl House, its walls covered with mirrors and ground glass, was the home of the eccentric mystic Helen Martins (1898-1976) who was immortalised by Athol Fugard in his play The Road to Mecca. Her creative talent is displayed in the Camel Yard where statues of camels, wise men, churches and mermaids, all created from broken bottles, fragments of mirror and cement, turn the space into a fantasy world. The Kowie History Museum concentrates on local social history with an emphasis on the period 1820-89. Displays include the Briseis (wrecked 1859), the Xhosa, and marine shells. Bayworld, formerly the Port Elizabeth Museum, offers a variety of live animal displays, including dolphins, seals, penguins, fish, snakes and crocodiles. Historical exhibits include shipwrecks, dinosaurs, Xhosa beadwork, historical costumes and local fossils. No 7 Castle Hill is a historical settler house (c. 1830), furnished in the style of the mid 19th century. Its collection includes furniture, domestic items, ceramics, royal commemoratives, crested china, dolls and toys, luggage, and pictures. Prince Alfred's Guard Museum houses a military exhibit in a Victorian Drill Hall (1880), a national monument and one of the finest surviving examples of its type. The South African Air Force Museum, a satellite of the SAAF Museum, Swartkop, Pretoria, focuses on military aviation. Exhibits include Mirage F1 CZ, Atlas Kudu, Impala, Westland Scout, Bell 47,2 x Harvard and Bosbok aircraft and other related exhibits. A research library is available. The St Croix Motor Museum features more than 80 vehicles, the earliest of which is a 1916 model. The vehicles are taken on the roads in and around Port Elizabeth once a month. The museum has a fully equipped restoration workshop and a library. The Port St Johns Branch of the Umtata Museum is housed in the old Free Mason Lodge. It features the cultural history of the local people and local natural history (birds and mammals). The Queenstown and Frontier Museum is housed in a national monument. Its main focus is on the history of Queenstown and surrounding districts and it includes a large telephone and medical equipment collection and some natural history. The Somerset East Museum is housed in a Georgian manor house which had been a parsonage for 105 years. A period house museum (late 19th early 20th century), among its attractions are a Victorian herb garden, more than 700 roses, a blacksmith's shop, and the town's oldest cemetery. The Sterkstroom Museum is an old fashioned shop with a collection of crockery, household items, kitchenware and buttermaking tools. It also features the history of Sterkstroom and an agricultural exhibition. The Cuyler Manor Farm Museum complex is housed in a Cape Dutch manor home, circa 1814, which belonged to General Jacob Glen Cuyler. The exhibit depicts the early lifestyle of the people of the Eastern Province. The Drostdy Museum, occupies a Cape Dutch style building, circa 1809. Its focus is on the historical development and growth of Uitenhage and the surrounding districts through furniture, clothing and household items. It also has an archive library. The Station Museum, housed in the original railway station, depicts the Victorian lifestyle of the period. It also portrays railway history through a display of steam locomotives, rolling stock and luggage. Beetle lovers will enjoy the Volkswagen Motor Museum with its display of vehicles made at the local Volkswagen factory, from the first models (1932) to the last "Beetle" to come off the local assembly line. The Umtata Museum, in the Old Post Office building, features displays of cultural and natural history, local birds, mammals, geology, archaeology, a beadwork collection and old photographs. In the Kaya Lendaba Arts and Cultural Village in the Shamwari Game Reserve visitors can observe rituals; be introduced to healing by means of indigenous plants; visit a healing cave; attend discussions about bones of divination and African astrology, and study alternative medicine. The Isinamva Cultural Village is an authentic inhabited Xhosa village, where visitors spend a day listening to storytelling, visiting healers and development projects, doing daily household chores, and so on. At the Khaya la Bantu Cultural Village, a Xhosa homestead on a working farm, visitors can learn about Xhosa culture through guides who act as interpreters.